Home/Mind Body & Spirit/Breathtaking Kerala! As the plane lands we are overwhelmed with excitement, curiosity for the unknown and anticipation to explore this beautiful paradise we have heard so much about. The sound of music from a nearby temple fills the air, and we know that we have arrived. 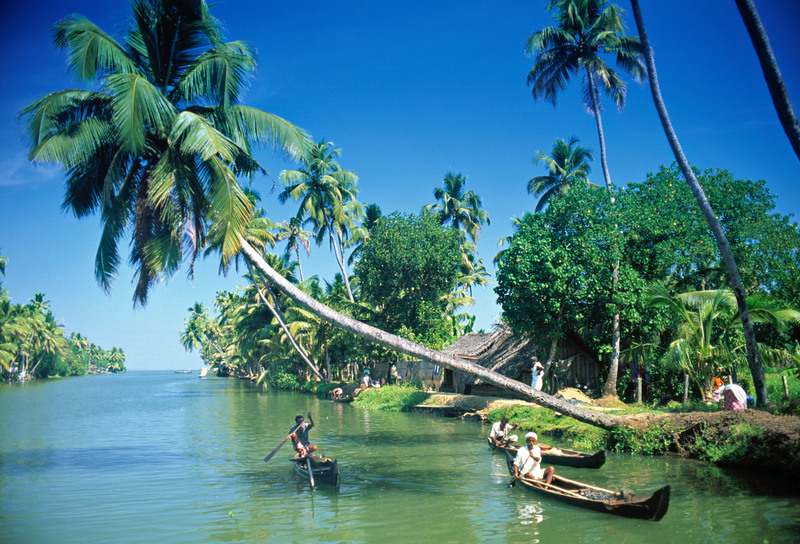 We are at ‘God’s Own Country’, we are at the Land of Coconut Trees, we are at the Spice Garden of India, we are in KERALA! Taking over the MBS Festivals in Cyprus was one of the most fulfilling decisions we have ever made! Lovers of the MBS values and principles for years we knew that we had a lot to offer but also a lot to gain from this spiritually fulfilling journey. One of the most amazing gifts derived from our work was this outstanding trip; the opportunity to see another intense culture ,and to meet some fascinating people, experience first hand this mesmerizing country filled with joy and happiness and humble welcoming people. As we arrive at the Somatheeram Ayurved Resort the smell of fresh pineapple and coconut juice overwhelms us. The taste is so different, so pure so real. We are surrounded by exotic flowers and tropical plantation. Above us are tall coconut trees and colourful butterflies . There is a feeling of pure calmness in the air, people working with a smile on their face which is heart felt, women dressed in alluring saris, ready to help us explore their paradise. The next morning found us in ‘tree pose’ on our yoga mats. We were ready to experience and explore our inner selfs, through the incredible yoga training by our renowned trainers Anna Zorzou, Nikos Manolis, & Nicki Petroulaki! Every training and meditation with these amazing trainers gave us a whole new truly intense prospective on yoga. Another marvellous facet of this journey was experiencing Ayurveda in all aspects. Meeting the Ayurveda doctors and healers with years of experience and high professionalism, was one of the huge additional benefit of this experience. Treatments conducted with the most pure ingredients picked straight from the Ayurveda garden, with amazing results. The food cooked with the Ayurveda standards, helped us in detoxifying our bodies and feel renewed. Starting our journey of Kerala outside the resort was another hypnotic experience! Temples build with so much detail and breathtaking statues, sights that I could not have believed were real! Tropical forests filled with the most astonishing thick plantation and flowers that I have never seen before. The Elephant sanctuary; being able to connect with these magnificent creatures. Markets filled with spices and herbs , endless colours and scents. Time flies so quickly especially in this beautiful paradise.. As we say goodbye to Kerala we have mixed feelings of sadness for our departure but happiness and gratitude for the opportunity to have lived this experience. We know that we want to return soon. Thank you Kerala for this amazing gift to have experienced even for a short time your amazing beauty in all aspects! Thank you for this purifying Mind Body & Spirit clensening! Thank you Anna Zorzou, Nikos Manoli & Nicki Petroulaki for the amazing yoga trainings! Thank you Ayama Yoga Retreats for making this a reality! Thank you co travellers for sharing this spiritual expansion with us! Until the next time ഗൂട്ബ്യെ കേരള (goodbye Kerala)! The MBS Travel Team is going to Tanzania – Zanzibar on the 29th Of April 2016 – 05th of May 2016! Join us! For more information call 96-382333.